O-Pee-Chee has shown itself to be a very consistent card release year after year. It is a brand that sticks to the classic look of cards on actual cardboard. If you're a fan of cards that came out in the eighties and nineties, this set could be right up your alley as the cards look and feel like the standard cards from those decades with a little bit of modern touches thrown in for good measure. 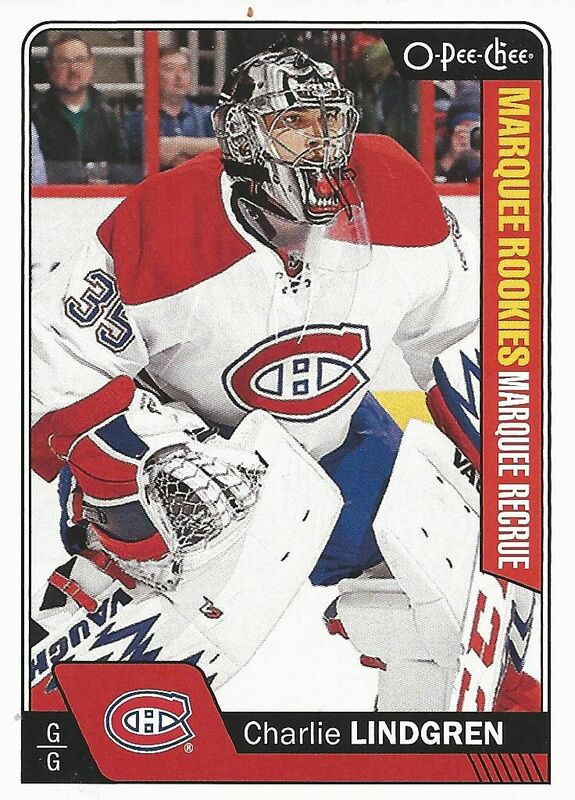 I've said this before, but the basic O-Pee-Chee design is what I think modern cards would look like if the card companies didn't begin innovating new types of cards throughout the years. If they didn't, you'd have cards continue to be on cardboard stock and in one giant release. That's not a bad thing though... those years were a great time to collect cards, and this release does bring back some memories of the way things were. As I've stated, the cards are on old style cardboard with a simple white border. Thought the border is white, it's not like the low-end gloss borders that you might find in other low-end brands. These don't have that shine, which I think is a good thing. The cards feature a simple lower portion that has the player name, position, and team along with the team color in a basic looking graphic. The cards don't really stand out in any way - I think the design will easily be forgotten when another release comes, but at least it isn't offensive. It clean, simple, but kind pedestrian. I've always been a fan of the OPC card backs and the same holds true here. In fact, I may like these more than past OPC backs. The cards have a really sweet grain to them if you inspect them closely. Probably no two cards are exactly alike in the set. 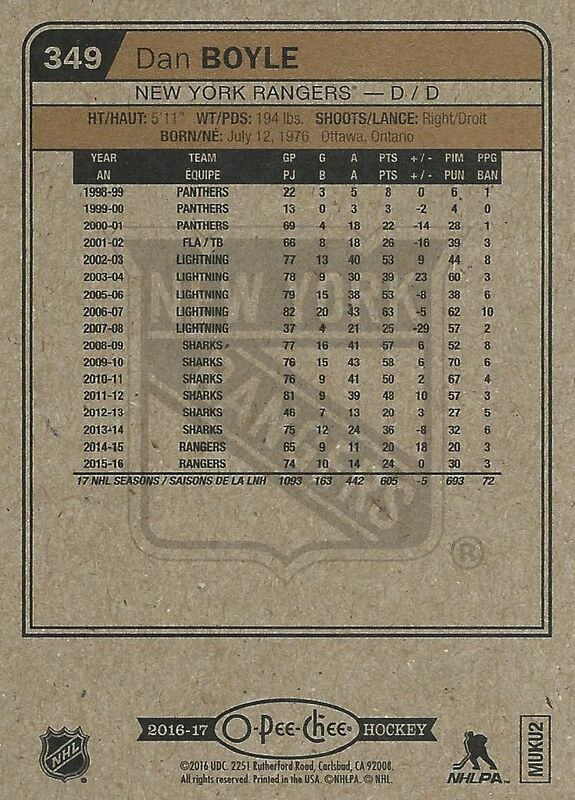 The cards also have a bronze hue used to highlight the player name and information. This part of the card shimmers nicely and makes the back have a bit more of a premium feel. The Marquee Rookie subset this year doesn't go for a changed card design, instead, the rookies just get a side banner on the card denoting the player's rookie status. The banner is non very intrusive to the card, but in flipping though cards quickly, you may miss a rookie here and there. Besides the rookies, some base cards denote players who were all-stars or who had a season highlight. These cards are base cards as well, but have a special designation on the front of the card. Boxes of OPC come with a whopping 32 packs. Sure, it's not the 36 count box of the eighties, but 32 packs is a lot of packs for collecting today. OPC is not a hit driven product, in fact, it's pretty hard to score a hit from a box... but it does feature some really fun inserts... some of which can be very tough pulls. 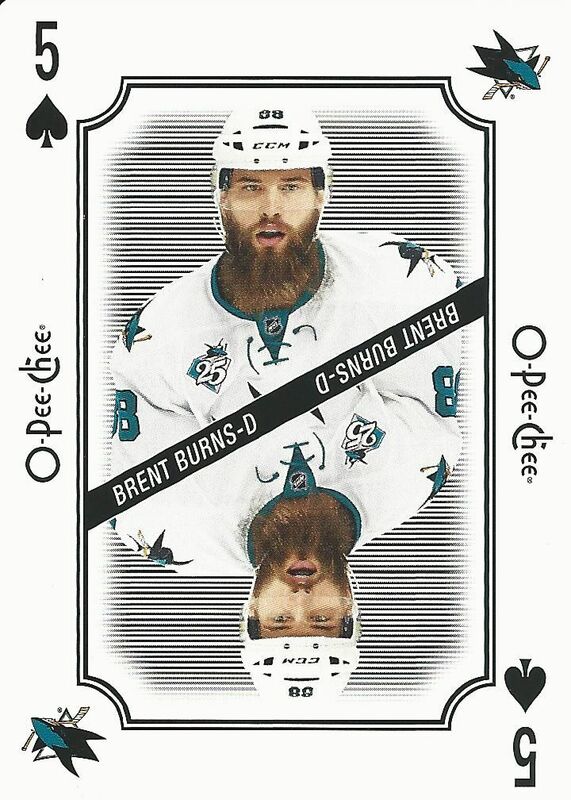 One of my favorite inserts in OPC are the playing cards. These cards have the feel of a cheap deck of cards that you might find at the store. They are not the tough casino cards! 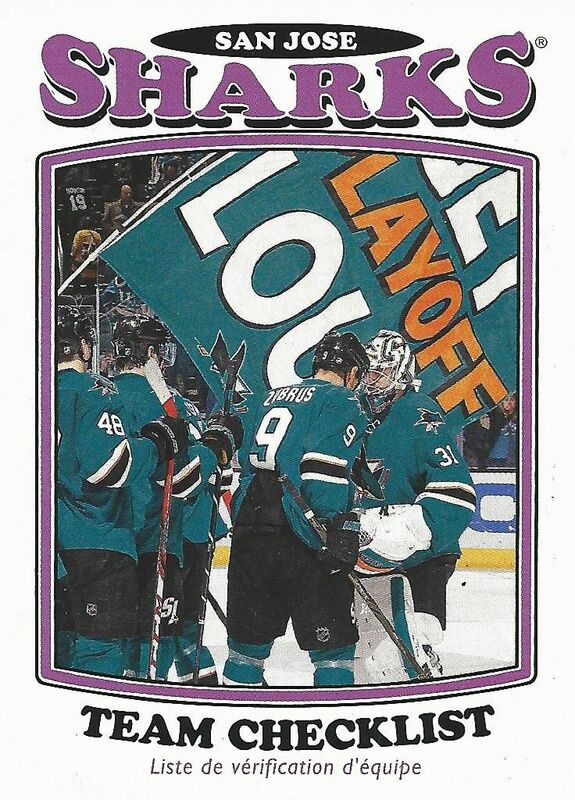 But at least the designers at UD gave these cards a different feel and cut than a regular hockey card. Collectors can try to build an entire 52-card deck. It is a difficult proposition, though, as some of the cards come at some very long odds. An ace for example comes 1:200 packs. The V Series of square-cut cards are back and feature the square-y goodness of the square. These cards come about two a box and gives mini card fans something to look for and collect. I personally am not a fan of mini cards as they are difficult to store. These at least are the width of a standard card so they fit pretty well in a penny sleeve. Typical tobacco style mini cards slip around inside sleeves, which gets pretty annoying. Going even more retro than the regular base cards are the retro base parallel cards. These cards parallel the set of OPC and have an even older design. 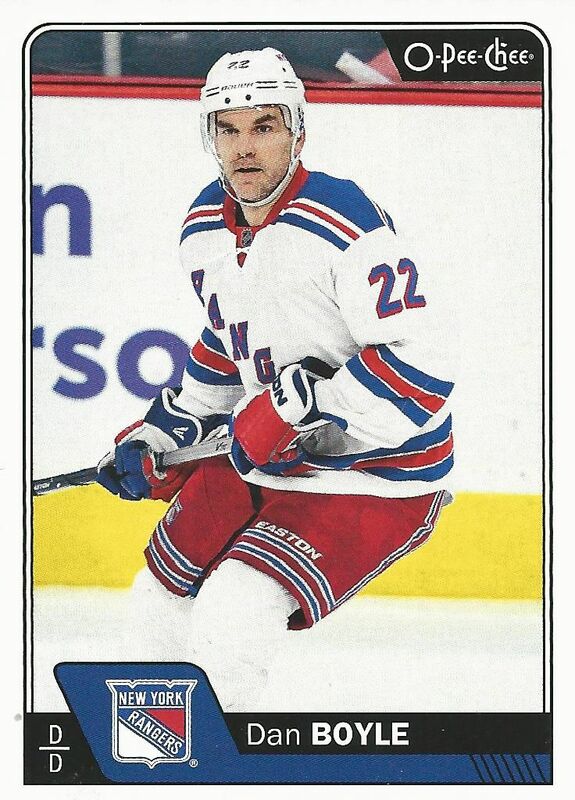 Rather than showing the player in the middle of some NHL action, these cards have a closer up photo of just the player on a single color background. 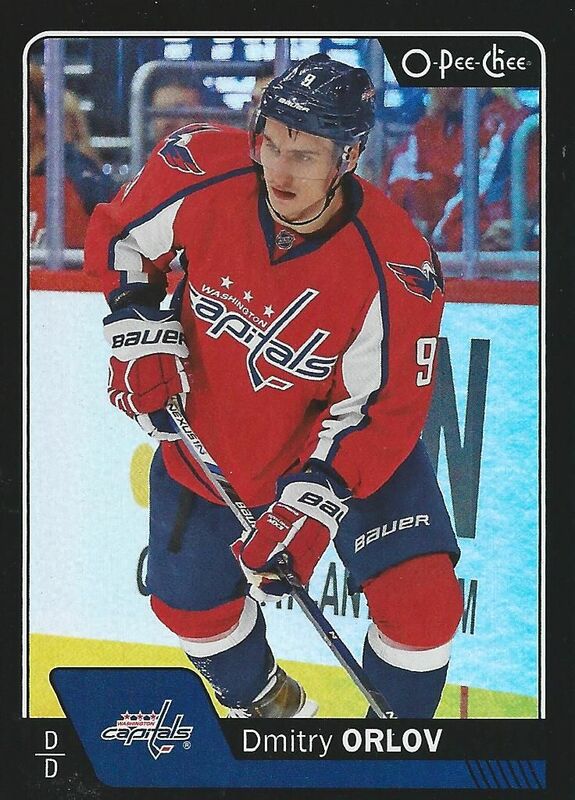 I usually really love retro looking things, but in recent years OPC retro cards have felt phoned in. 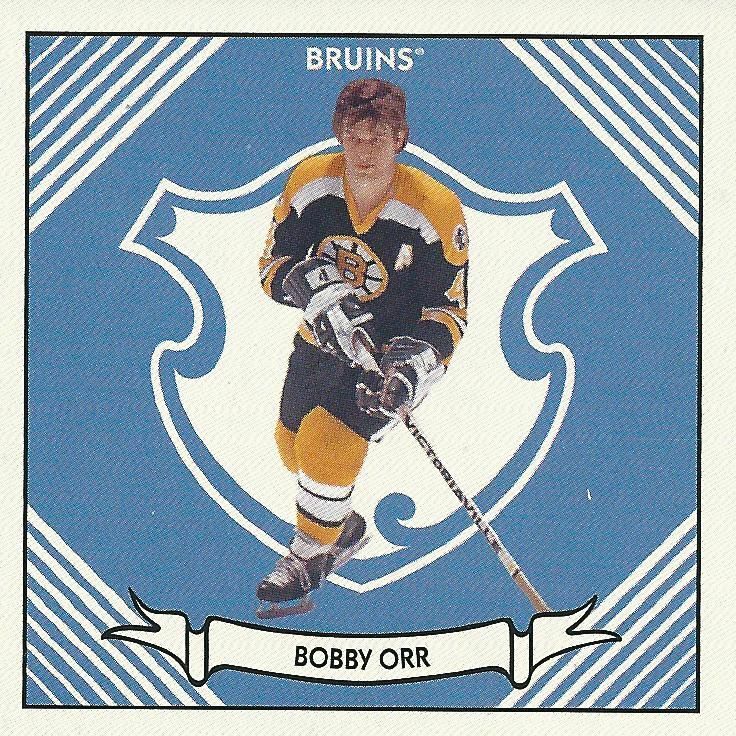 I would love to see OPC retro cards that featured a killer design that would drive collectors to them. Another parallel of the set are the rainbow foil cards. These are the cards that I suppose bring OPC into the modern era. The foiling is nice and features a rainbow effect when in the light. It's interesting how these cards are a different type of foil than the chrome process UD uses for their OPC Platinum set. This foil has a little texture to it whereas the Platinum cards are very, very smooth on the surface. A parallel of the rainbow foil cards are the black bordered versions. These cards have a very black border which gives the card a meaner look. The black bordered cards are very striking and feature serial numbering to just 100. I was lucky enough to pull an autographed card from my box of O-Pee-Chee. 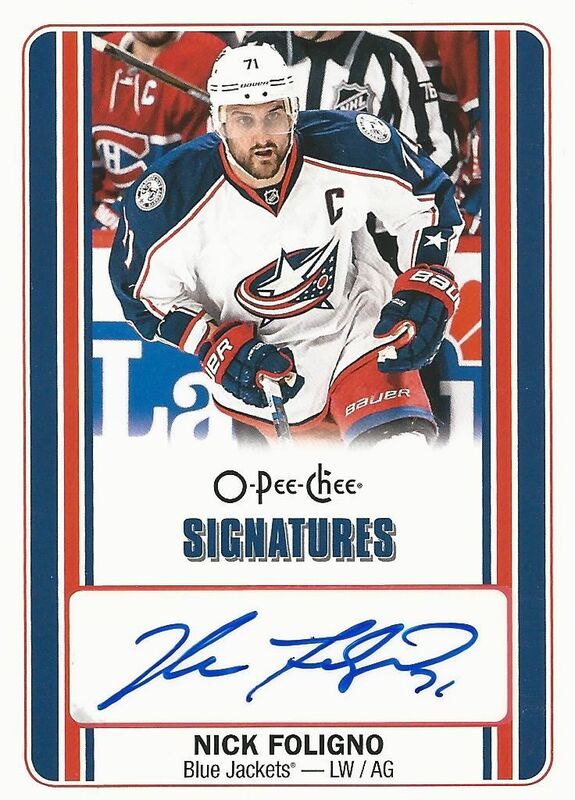 The autograph is a simple OPC Signatures card that features a simple, yet pleasing design. The autograph is on a sticker that fits really nicely into the area it is given on the card. Autographs are pretty tough pulls out of OPC so I'm happy to have one. The OPC Signatures don't really have big star names in the set, but the Team Canada autographed cards have legends like Wayne Gretzky available to be pulled. Probably of more value than the autograph I pulled was this super short printed All-Timers card of Chris Chelios. Upper Deck snuck in some really rare cards at the end of the base set. These cards have a white back and unique looking design to them. Though they look like something you'd typically find in an OPC product, these cards actually command a nice price! OPC has put special patch cards within boxes of the product and the same goes for this year as well. I didn't pull one, but I did get an autograph so I'm not complaining. OPC might be a cheaper retro release, but don't let that fool you... there are some great things you can find in these boxes! 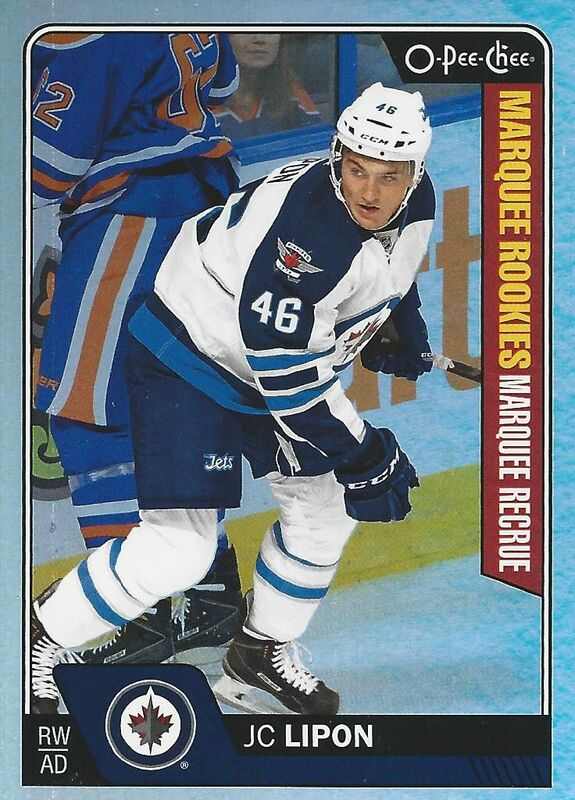 I am impressed with O-Pee-Chee this year. This is a brand that is putting a lot of fun into collecting. I love the fact that you can find a ton of unique inserts that look great and have some value to them. The ideas for some of the cards like the 52 card playing deck are really awesome. I just had a ton of fun as I was going through my box of OPC. OPC will never be a product that is limited or hard to find. I'm sure there are boxes of it available at both hobby stores and retail stores as well. I personally think OPC is well worth the price this year and am glad I got a chance to open up a box of it. I've also had a lot of fun checking out all the inserts that have been listed on eBay already. Usually I'm not that interested in them, but for whatever reason I like what OPC is putting out this year. I'd definitely recommend OPC to anyone interested in getting some hockey cards. There is a little bit for everyone in this product. Nice auto! I like the base design. Nice product with alot of packs. Great Review! Great box! I just LOVE those playing card inserts, they are just so cool. Thanks for another great review! Love the cardboard design but not a huge fan of this product. No guaranteed hit or anything from reading the product review. I would say this is a base collectors dream..
Great review! I love the base card design. I'm going to need to save up and get this! I love the the cardboard design that they have on the card. In my opinion I think that the cards look great. I love this years base design! I love everything but the very bland base cards. Really like the playing cards. Also like the design on the auto's. Really like this product this year! Great Variety of cards for young collectors at a good price! 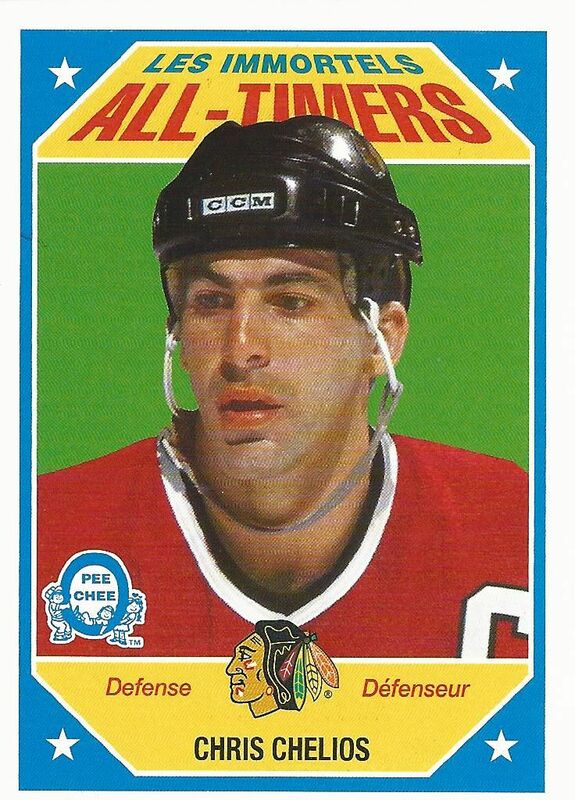 I love that All-Timers card of Chris Chelios! sweet cardboard backs! and the all-timers card is a nice one! Playing cards are really neat. I've always been an OPC guy! I do wish they would have left the season highlight cards for score because I don't care for them. Love that retro Chelios, mini Orr card, and the Jets inserts you got. GO JETS GO! i also love the cardboard back. can't wait for retail. I love o-pee-chee, I personally like platinum much better and that is the set im waiting for. But as always, thanks for the great review! I always have enjoyed O-Pee-Chee. I bought some packs and it is always fun to open. You don't get a lot, but there are no base packs so that's great. I think the Marquee Rookie design could have stood out a bit more though. Nice break! Overall the product looks great! Seems like a great product! Would have been nice to pull a Glo-Pee-Chee, certainly. It's a nice set. Really like those playing cards gonna pick up a box of these in the future to come! Loving the classic cardboard backs. I'm in UK and its virtually impossible to get any hockey memorabilia at all let alone trading cards. I'm on the fence about this product, some inserts are nice but I really dislike some! !